Lock in a great price for Ancor Hotel – rated 8.1 by recent guests! Location was great, you can walk to downtown in 30 mnts top. Our room had view on the lake and for being not so far from the main road, was pretty calm. One of the windows had a nice view of the lake. Car parking with easy access to the hotel. Location across street from Lake Annecy was pleasant to be able to walk in the morning or evening. Onsite parking was a bonus. Lobby and dining areas were good and room was nice and reasonable size with partial view of lake through the trees. Private secure car park. Clean, comfortable and better than I had expected. The position where this hotel is located is perfect if you want easy access to the lake promenade. It has a nice terrace where you can enjoy your coffee, private parking and a good breakfast option. The team from hotel was very friendly and helpful. From hotel till city center you will have around 20 minutes of walk, most of the part is done on the lake promenade. The receptionist was very friendly and welcoming. I even received a call to say what time the reception closed at night as I was arriving late evening. I only stayed one night but it's in an excellent location overlooking the lake and a short walk to town. The room was very clean with good en -suite shower. The reception and breakfast area were very smart. Everything about the hotel and the adjacent brasserie was excellent. The staff were all friendly and helpful. 10 out of 10. Pleasant location at the edge of town facing the lake and prom. Free parking. Good 20 min walk to old town. Nice large room with lovely balcony, comfortable beds, nice location on the lake. Located in Annecy Le Vieux in the French Alps, Ancor Hotel is composed of 2 buildings with rooms that overlook Lake Annecy or Mont Verrier. Each room at Ancor Hotel is equipped with free WiFi access, a flat-screen TV with cable channels and a private bathroom. Some rooms feature a terrace and air conditioning. A breakfast buffet is served daily. Activities in the surroundings include hiking and water-skiing. The Lake of Annecy is 150 feet away, and the lake's beach is 800 feet from the property. Free private parking is available on site. Ancor Hotel's multilingual staff can provide local tourist information. When would you like to stay at Ancor Hotel? This air-conditioned twin room has a private shower room with a toilet. The room is equipped with a flat-screen TV with Canal + channels, a desk, a safety deposit box and a telephone. This superior double or twin room has a private shower room with a toilet, a hairdryer and a heated towel rail. The room is equipped with a flat-screen TV with Canal + channels, a desk, a mini bar, a wardrobe, a safety deposit box and a telephone. This air-conditioned double or twin room features a terrace or balcony and a seating area with a sofa bed. The private shower room has a toilet, a hairdryer and a heated towel rail. The room offers a mini-bar, a desk, a wardrobe, a flat-screen TV with Canal + channels and a telephone. This single room has a shower room with a toilet, hairdryer and heated towel rail. The room is equipped with a flat-screen TV with Canal + channels, a mini bar, a wardrobe, a safety deposit box and a telephone. This air-conditioned single room has a shower room with a toilet, hairdryer and heated towel rail. The room is equipped with a flat-screen TV with Canal + channels, a desk, a wardrobe, a safety deposit box and a telephone. This superior double room has a shower room with a toilet, hairdryer and heated towel rail. The room is equipped with a flat-screen TV with Canal + channels, a desk, a mini bar, a wardrobe; a safety deposit box and a telephone. This air-conditioned double room has a shower room with a toilet, hairdryer and heated towel rail. The room is equipped with a flat-screen TV with Canal + channels, a desk, a wardrobe, a safety deposit box and a telephone. This air-conditioned triple room has a shower room with a toilet, hairdryer and heated towel rail. The room is equipped with a flat-screen TV with Canal + channels, a desk, a wardrobe, a safety deposit box and a telephone. House Rules Ancor Hotel takes special requests – add in the next step! Ancor Hotel accepts these cards and reserves the right to temporarily hold an amount prior to arrival. Please note that there is no capacity for extra beds or extra guests in the rooms. For guests wishing to have lunch or dinner at the Wyn restaurant across the hotel, please make sure you book it in advance. Please note that some Superior Rooms do not have air conditioning. Please note that the property consists of 2 separate buildings joined by a road. 1. It’s not in the center of Annecy. 2. I sent 3-4 emails before we arrive and I think one was replied to but did not exactly answer my queries. It is just a small hotel so i would like to think that its email traffic is not so bad as to not reply to my emails. 3. The owners (?) and staff do not speak/understand or speak/understand very little English so we have a problem with communication. The room size was a little small for my taste even facilities were exactly like in the description from the site. The room was a bit small. It felt very tiny and with two big luggage, there was barely any space to walk around. Our 2nd time here! Perfect! View of car park and standard double bed. Location and a restaurant Le Wyn across the road. The bathroom had a sliding door which did not completely close so not entirely private. The staff were fantastic and so helpful. The door of restroom couldn't be closed, The water pressure in the shower was very low. The air-conditioning didn't warm the room good enough. I had to leave very early (before reception opened) so there was no way of getting a hot drink . I know French hotels don't always provide tea and coffee making facilities in the room but maybe there could be some sort of coffee machine where you could pay to get a drink. 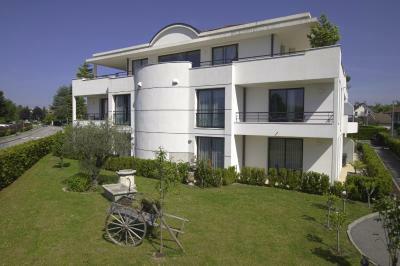 The hotel has a nice location right in front of the Annecy lake but not that close to the town centre. A restaurant is just some 100 m away. The room was nothing special but clean and quite OK for one night stay. Own car park. Good breakfast.